Move to the country? Nah...just move here and you'll feel like you did! 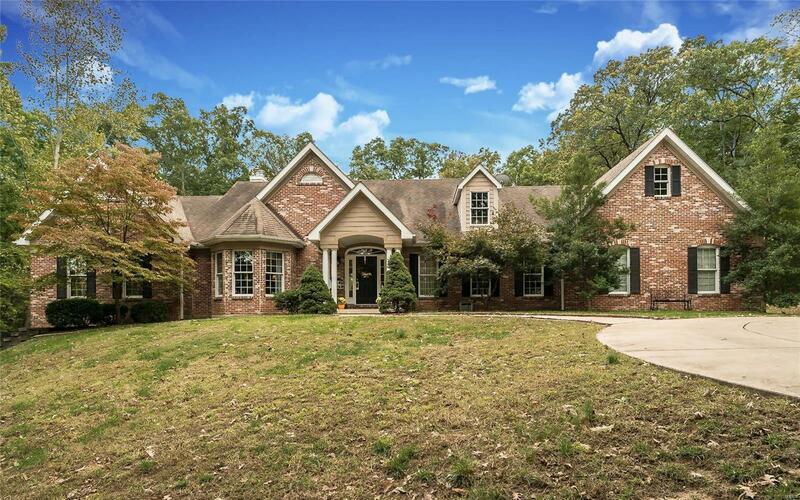 Custom ranch on FOUR wooded acres. Enjoy seclusion, not just from homes, but the street as well. Extra wide, concrete circle driveway takes you to this beautifully landscaped brick home w/ 3 car garage & nice patios. Breathtaking & completely open main living space with 15' vaulted, beamed ceilings, floor to ceiling stone gas fireplace & a wall of windows to watch the wildlife wander. The massive kitchen with so many cherry cabinets, some new appliances, & a walk-in pantry. The main floor laundry is also a nice hobby rm. 9' ceilings in the rest of the main floor. Master suite has two walk-ins, luxury bathroom with double sinks and jetted tub. Finished walkout lower level has TEN FOOT CEILINGS, family rm, wb stove, theater room, two large beds w/ walk-ins, full bath & tons of storage. Zoned HVAC (one new furnace and AC), two water heaters (one new), built-in speakers, whole house generator, compressor. AHS warranty! Copyright 2019, Mid America Regional Information Systems, Inc.(MARIS). All rights reserved. REsolutions does not display the entire IDX database of Mid America Regional Information Systems, Inc. (MARIS MLS) on this web site. Property listings of some REALTOR® brokerage firms have been excluded. Listings displaying the MARIS logo are courtesy of the participants of Mid America Regional Information Systems Internet Data Exchange. Information provided deemed to be reliable but is not guaranteed to be accurate. Buyers are advised to verify all facts before making a decision on purchasing a property. No warranties, expressed or implied, are provided for the data herein, or for their use or interpretation by the user. Mid America Regional information Systems, Inc. (MARIS) will not be held responsibility for the content of such records. Last Updated On: 2019-04-18.